I getting more and more comfortable with the concept of "geezerhood", and in my new role, feel entitled to share my life experiences with all of you whippersnappers, whether you want to hear them or not. 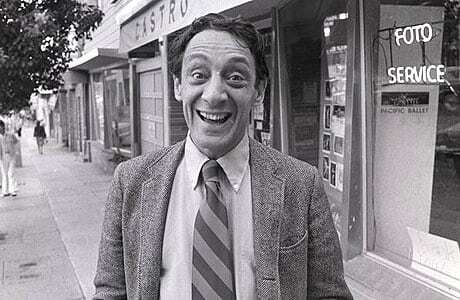 Two stories I would like to share concern my experiences with Harvey Milk. He rose to prominence during a particularly troubled political time, but I feel he had an enormous impact on the mainstream perspectives about the gay community. I was doing a lot of black and white photography in the early seventies, but when it was time to do color, Kodak Ektachrome was my film of choice. Since I live within walking distance of the Castro, I'd bring my film to Castro Camera, then located on Castro between Eighteenth and Nineteenth streets. I recall the excitement I felt whenever I opened the yellow slip-top box indicating this was genuine Kodak processing, and then laying my precious transparencies on the shop's light table for closer inspection. I remember one instance when I had six posters made from some of the many photos I made during my "internship" at a private school south of San Francisco. They were to be delivered to a local client who would bring them to New York for a display at an education conference. I was assured by Harvey and the printer that they would be done in time, but due to a hang-up in production, they were two days late. Harvey complained to the printer on my behalf, and arranged to have them sent via air freight to New York in time for the presentation. The cost to me? Nada. Mr. Milk has something for everybody. Harvey certainly did, and he proved to my satisfaction that one could be a strong advocate for one group of people without alienating everybody else. The era and the movement could not have had a better champion.